Hippotherapy uses the movement of the horse to integrate warming and stretching of the child's muscles, stimulation of postural muscles, facilitation of body awareness, normalization of tone through rhythmical movement, sensory integration, and overall strengthening. The horse's gait imparts a mobilization of the pelvis that simulates normal walking, a benefit that cannot be reproduced in any other clinical setting. The horse's gait can also be manipulated to directly affect specific deficits. Additionally therapists challenge the child with functional activities while on the horse to further improve balance, motor control and planning, and coordination. As effective a tool as horses are, one of the greatest benefits is the motivation, acceptance and unconditional love they give to these very special riders. Hippotherapy is a strategy incorporated into the comprehensive treatment plan for qualified clients at BEATS. 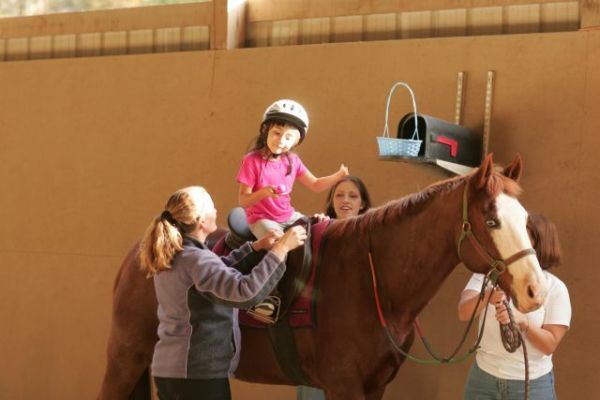 Therapeutic riding is a recreational sport that teaches children and adults with special needs the skills necessary to ride a horse as independently as possible. While the rider still benefits from the natural properties of the horse, they are also given the experience of participating in an activity with their peers. Lessons are conducted by PATH Certified riding instructors who are specially trained to teach riders with a variety of disabilities. BEATS is the home to the Cherokee County Special Olympics Equestrain Team. Our qualified riders have the opportunity to complete at the State Horse Show sponsored by Georgia Special Olympics. Aquatic therapy also has unique qualities that provide a more efficient treatment that can be accomplished in a clinical setting. Buoyancy, a natural property of water, allows the child to move and use muscles that are too weak to function on land against gravity. Resistance, another property of water, strengthens and reinforces movement patterns. Water also provides sensory stimulation and organization that allow children to explore movements that are difficult for them normally. Water is fun, motivating and a ‘normal’ environment for children who are otherwise separated from peers in clinical settings.